This review was written for the Egremont 2Day newspaper in May 2015. While Alfred Hitchcock’s retelling of John Buchan’s classic novel ‘The 39 Steps’ is a great movie it is fair to say that 80 years later it is a little dated. How then, do you put it on stage with just four actors and make it into something that won’t bore the audience? The answer is simple: turn it into comedy. That’s precisely what the latest production at Keswick’s Theatre by the Lake has done; and what a comedy it is too! It’ not often you find me howling with laughter but the cast worked their magic so well that I left the theatre with aching sides and a big grin on my face all the way home. In the official publicity for the play we’re told that four actors play 139 parts. This is true. What it doesn’t say is that the majority of these parts are played by just two of the actors, known as Clown 1 and Clown 2 in the cast list. The two actors playing these roles – Patrick Bridgman and Richard Earl – were absolutely fantastic and stole the show despite perfect performances from Frances Marshall and handsome lead Jonny McPherson who were also very funny. The four of them made extensive use of a variety of props as tea chests, ladders, lampshades and sheets were used and re-used hilariously to lead us through the adventure. The play is perfect for all ages – if your children are old enough to sit through a couple of hours of a play then they will enjoy the slapstick comedy. Teenagers will love it (my daughter certainly did) and the older generation will enjoy it no less (watch out for the gag about the Forth Rail Bridge which only ‘the oldies’ will get). Despite being a spoof on the adventure tale, there are some genuinely hair-raising moments as Jonny McPherson dangles perilously from various stage props. I don’t know how director Abigail Anderson got it all past health and safety but I’m glad she did. Highlight of the play for me (and I suspect for most of the audience) was the scene with the two clowns on a railway station with a number of hats. I’ll say no more other than it was perfectly timed comedy which had us all roaring with laughter and we all but gave a standing ovation at the end. You simply have to see the show if only for that one scene. I can only surmise it took hours of rehearsal to perfect and the practice was well worth it. 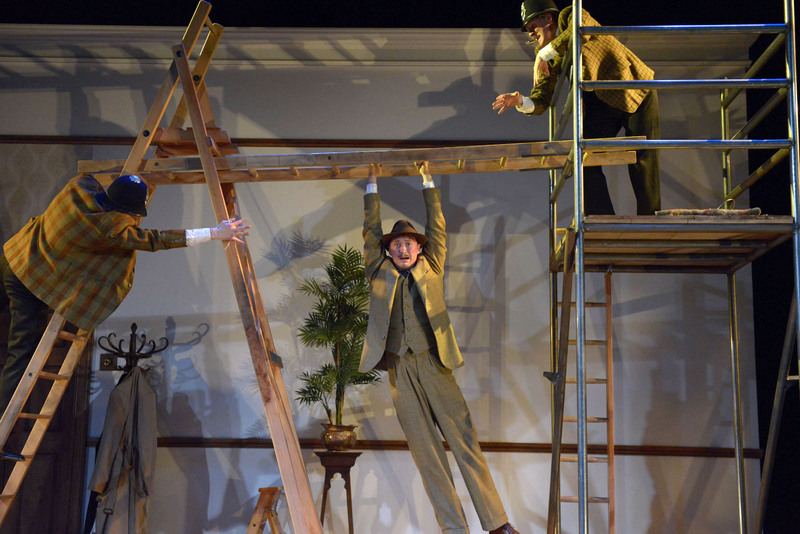 The 39 Steps runs until Wednesday 4th November. Tickets are available from the Box Office – call 017687 74411. We are a London theatre blog, please check us out.